Six Hymns in Six Days "FREE"
David John Potter (16 September 1952) is a pianist, timpanist, percussionist, composer, arranger, web designer, and PMI certified project manager. He is married to Lurlynn Burnett Potter. Their blended family consists of 17 children and 24+ grandchildren. When Dave was 15 years old, he starred in the Walt Disney's Wonderful World of Color production of "The Owl That Didn't Give a Hoot". The story was about a young boy who finds and raises a baby owl ... and all the adventures they go through. This experience gave Dave his initial exposure and love for making videos. There are clips of the movie in Day 4 of Week 1. 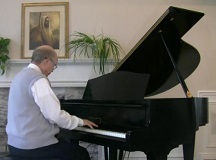 David loves the piano and has produced several CD's of his favorite hymn arranagements. For several years he played percussion / timpani in the Bartlesville Oklahoma Symphony. He also played in Orchestra at Temple Square where he also served as the personnel manager, librarian, and personnel manager for "The Savior of the World" production at the LDS Conference Center. While serving a mission in Brazil from 1971-73, David began designing this piano course. After his mission, he studied piano with Reid Nibley at BYU. In 1980, while serving as the Branch President in Pawhuska, Oklahoma, he put together a prototype of the course. He presented his ideas to Reid .. and the two of them published the course "Six Hymns in Six Days" with SONOS MUSIC. The course has since been used around the world. A year after Reid passed away, David felt strongly impressed that this course needed to be enhanced and made applicable for a world wide audience. He purchased the copyrights from Sonos and has dedicated most of his time in updating the course. He has traveled around the United States in producing videos at various scenic locations. He has also arranged over 130 hymns/songs in his special simplified style. His main goal is to "Hasten the Work of the Lord" through helping people learn how to play the hymns and for them to be able to share their talents with their families, their congregations, and for just themselves. Combining his computing, musical, and video skills ... he is now making this course available via the internet at no cost. Closed captions will soon be available in over 50 languages! His goal is to also create individual video instructions for each of the hymns. Richard (Reid) Neibaur Nibley (5 January 1923 – 25 February 2008) was an American pianist, composer and music educator. He wrote the beloved words and music to the Latter-day Saint hymn "I Know My Father Lives" . Reid was born to Alexander Nibley and his wife Agnes Sloan. He was the younger brother of Hugh Nibley. Nibley's ancestry was Scottish, English, French and Jewish. He became involved in music while still a child. He made his debut with the Glendale Symphony Orchestra at age eleven, and performed as a soloist with the Los Angeles Philharmonic at age 17. He was the principal pianist for the Utah Symphony Orchestra for ten years. Among Nibley's later instructors were Leroy J. Robertson and Gyorgy Sandor. Reid was a professor at the University of Utah, The University of Michigan and Brigham Young University (BYU). At BYU, Nibley also held the position of pianist-in-residence. Among Nibley's students at BYU was Kevin Kenner. He married Marjorie McBride in 1947 and they had six children. Marjorie died in 2000. In 2001, Nibley married Nona Gallacher. Nibley's hymn "I Know My Father Lives" is in both the Primary Children's Songbook and the 1985 hymnal of The Church of Jesus Christ of Latter-day Saints. In 1998, a CD of some of Nibley's works, Quiet Classics: Piano Meditations, was released. Nibley also wrote at least one sonata. Copying or reproduction of this publication in part or in whole violates the federal copyright law.